Explore millions of high-resolution images showing the spatial distribution of proteins in 44 different normal human tissues and 20 different cancer types, as well as 46 different human cell lines. 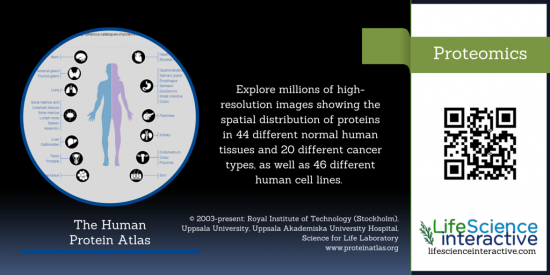 The Human Protein Atlas project was initiated in 2003 by funding from the The Knut and Alice Wallenberg Foundation. Primarily based in Sweden, the HPA-project involves the joint efforts of the Royal Institute of Technology in Stockholm, Uppsala University, Uppsala Akademiska University Hospital and more recently also the Science for Life Laboratory based in both Uppsala and Stockholm. International nodes of the project are based in Mumbai, India and other formal collaborations are with groups in South Korea, Japan, China, Germany, France, Switzerland, USA, Canada, Denmark, Finland, The Netherlands, Spain and Italy.